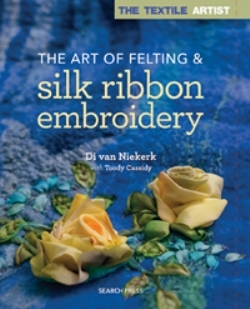 Learn to make flat nuno felting and felt surfaces, using wool, wool & silk and silk paper, and adorn these with exquisite silk ribbon deisgns. The felted backgrounds are explained step-by-step with detailed instructions and photographs. Making the different flowers and creatures is explained, with an illustrated gallery of stitches used. There are also 15 complete projects to inspire you, with lists or requirements.